Smoky Mountain go-kart tracks have long been a staple family fun adventure in the East Tennessee area, and there doesn't seem to be any slowing down in their popularity. Pigeon Forge offers the largest selection of Smoky Mountain raceways sure to keep speed demons happy. While Sevierville may not have as many go-kart tracks, their NASCAR Speedpark boosts the largest number of varied tracks in one location, from kiddie go-kart tracks to serious mini- race cars set for high speed racing competition. Start your engines today and head to one of the several Smoky Mountain go-kart tracks for a racing adventure the whole family will love. Kids of all ages will enjoy the taking the turns of Smoky Mountain go-kart tracks at high speeds! Enjoy some friendly family competition as your inner race car driver speeds off in full force. With several Amusement Parks offering indoor and outdoor tracks, there are several choices in Smoky Mountain raceways to add a bit of adrenaline to your Smoky Mountain vacation. 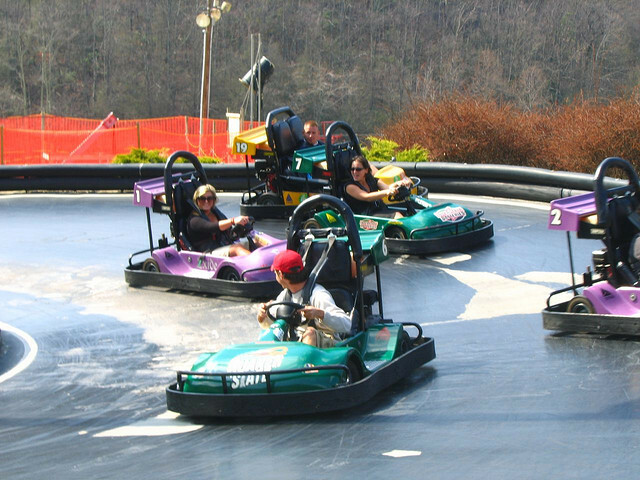 Speed Parks provide unique go-kart tracks built to handle specially designed go-karts with safety features that permit safe operation at speeds exceeding 35mph.Helmets and seat belts are required and age limits are in place at these extreme Smoky Mountain go-kart tracks. Let your inner Jeff Gorden, Dale Earnhardt Jr., or Danica Patrick come out at these high-speed Smoky Mountain raceways for one of the highlights of your Smoky Mountains family vacation. Locate Pigeon Forge go-kart tracks to kiddie kart tracks. Pigeon Forge offers the largest selection of go-kart tracks in the Tennessee Smoky Mountains. Slick tracks to woody coaster tracks set to get your adrenalin going while visiting Pigeon Forge. NASCAR Speedpark amusement park attractions for the entire family at one location. All Day Passes to go-kart rides, mini-gulf, thrill rides, kiddie rides and more offered. Birthday party rooms, arcade and food available. Enjoy 4 tracks at Speed Zone Fun Park Pigeon Forge that will have the entire family putting the pedal to the metal with 2 elevated wooden courses, a slick track, and a kiddie track for the little ones! Unleash your inner racer today at Speed Zone! Experience the fastest go karts on new tracks in Pigeon Forge, TN at Xtreme Racing Center! The karts here go a blazing 40 mph on a challenging track. See who can get the best time at this high performance go kart track in the Smoky Mountains!